Robins in the UK are associated with Christmas, and appear on lots of Christmas cards. A common explanation is that the Victorian postmen who delivered Christmas cards wore red uniforms, and were nicknamed "robin redbreasts". So people associated receiving their cards with Robins. The truth is probably much simpler, for Robins are most noticeable at Christmas. With bright red breast, which the bird puffs out to keep warm, and winter song, these birds bring colour and cheerfulness to drab surroundings. 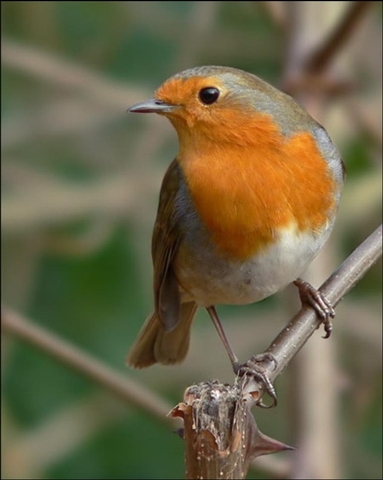 Robins are one of the few species of bird that sing in winter. It is also in the depths of winter, when insect food is scarce, that Robins seem most tame. So Robins have become as much a part of the Christmas scene as snow and holly. males’ territory they behave like young birds begging for food, thus stimulating the males to feed them rather than fight them. The sexes are very similar, if not identical. Some texts suggest that the brown forehead is "V" shaped in females, and "U" shaped in males, though even this is not always apparent. The juvenile Robin has speckled buff-brown upper parts and underparts. They have no red feathers so that adult birds do not attack them in territorial disputes. The speckled feathers are lost in a partial moult when the bird is about two to three months old. In winter, resident birds in the UK are joined by some immigrants from Scandinavia and continental Europe. A small percentage of British females winter abroad. Large numbers of birds from northern Europe pass through Britain in the autumn before continuing to Iberia and North Africa to winter.